In 1994 I thought to create a startup company based on the new "internet" technology. 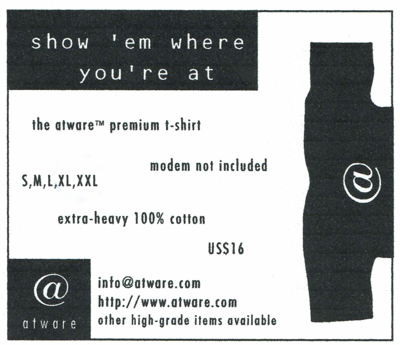 With some initial angel funding I worked on creating a brand of internet cafes and merchandise (called atware). I was one of the first dozen websites to sell merchandise directly from the web. I distinctly remember going to a tech conference that year and talking to a guy named Jerry who was sitting at a card table. He liked my idea, and said he would list my site on his site, and he followed through. Sadly, I don’t have a screenshot of that page on Yahoo! that listed me. And while I no longer have the digital record of this site (and it was too early to be captured by the Internet Archive), I did manage to find the artwork of a print advertisement I ran in Internet Magazine. One of the goals of the company was to establish a trademark of the @ symbol. I worked with a prominent trademark attorney in San Jose who took the project pro bono as a professional challenge to see if we could pull it off. We did not, as by then the @ symbol was considered an artifact in the general domain. I closed @cafe to take a very interesting position at IDEO in Palo Alto.